‘Benifuuki’ is a tea cultivar with strong resistance to disease (it can be grown with low rates of pesticide use), strong vigor, high yield, and a unique, splendid fragrance. ‘Benifuuki’ was bred from a cross between ‘Benihomare’ and ‘MAKURA Cd86’, released in 1993. 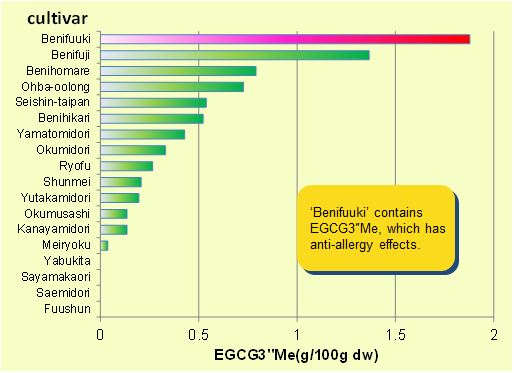 ‘Benifuuki’ is rich in O-methylated catechins (epigallocatechin-3-O-(3-O-methyl) gallate (EGCG"Me) and epicatechin-3-O-(3-O-methyl) gallate (ECG3"Me)), both of which disappear in the process of manufacture of black tea (1-3). These methylated catechins have many bioregulatory actions, including anti-allergy and anti-obesity effects. (1) Maeda-Yamamoto M et al. 1998. Biosci Biotechnol Biochem 62:2277-2279. (2) Maeda-Yamamoto M et al. 2001. J Jpn Food Sci Tech 48:64-68. (3) Maeda-Yamamoto M et al. 2012. J Agric Food Chem 60:2165-2170. ‘Benifuuki’ is rich in EGCG3"Me, which is not present in ‘Yabukita’,Japan's leading tea cultivar. EGCG3"Me strongly inhibits mast cell activation by preventing tyrosine phosphorylation (Lyn, Syk, and Btk) of cellular protein*, myosin II regulatory light chain (MRLC) phosphorylation**, and the expression of FcεRI***. 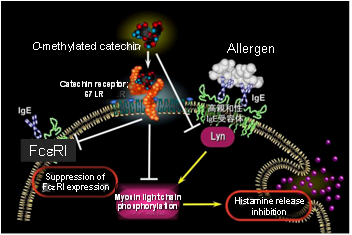 Suppression of MRLC phosphorylation through cell-surface binding to the 67-kDa Laminin Receptor (67LR) contributes to the inhibitory effect of EGCG3"Me on histamine release. It is therefore possible that mast cell degranulation (histamine/leukotriene release and interleukin secretion after FcεRI cross-linking) is inhibited by these preventive effects. *Maeda-Yamamoto M et al. 2004. Immunology 172:4486-4492. **Fujimura Y et al. 2007. Biochem Biophys Res Commun 364:79-85. ***Fujimura Y et al. 2002. J Agric Food Chem 50:5729-5734. The amount of EGCG3"Me in the stem is low. Higher concentrations of EGCG3"Me have been found in ‘Benifuuki’ green tea from the second crop at Kagoshima or the autumn crop at Shizuoka. Furthermore, EGCG3"Me is not detected in black tea (fully fermented tea) manufactured from ‘Benifuuki’. 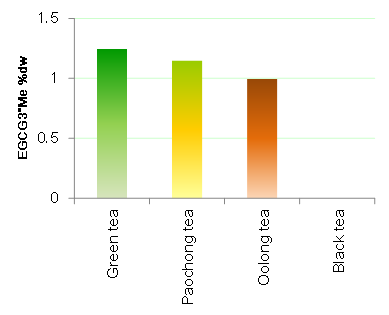 The EGCG3”Me content is high and the caffeine content and strictinin content are low in fully matured tea leaves picked late in the first cropping season or in leaves below the third leaf during the second cropping season. 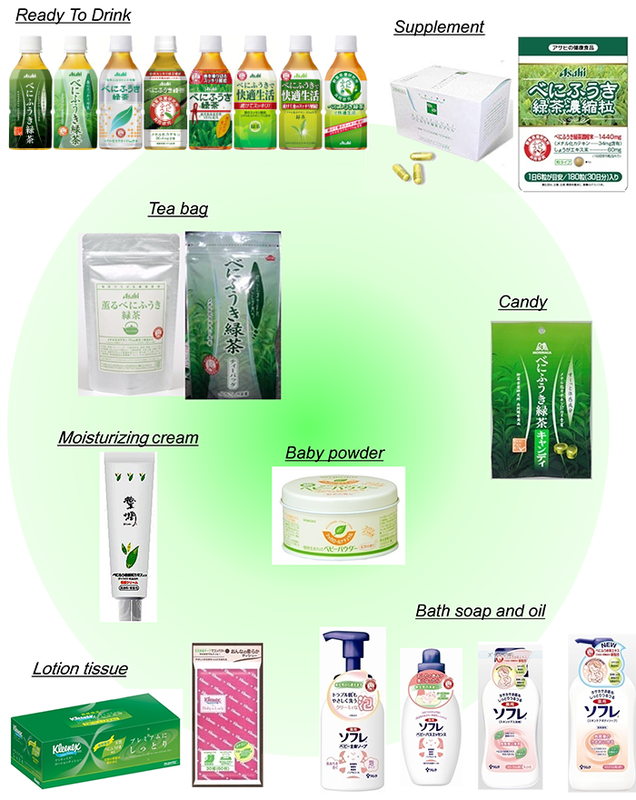 To obtain the anti-allergy benefits of EGCG3"Me, green tea made from overgrown ‘Benifuuki’ tea leaves picked from below the fourth leaf in the late first crop or below the third leaf in the second crop, and refined to remove the stems, should be consumed. *Maeda-Yamamoto M et al. 2004. Food Sci Tech Res 10(2):186-190. 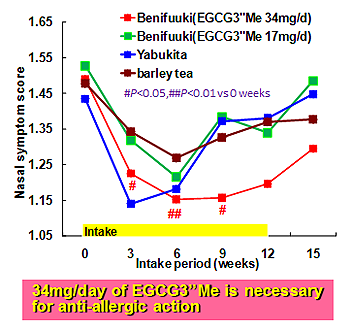 Ninety-one patients who had mild perennial allergic rhinitis and met the predetermined criteria for trial entry were assigned to one of four groups: ‘Benifuuki’ green tea beverage (34 mg/day of EGCG3"Me), ‘Benifuuki 1/2’ green tea beverage (17 mg/day of EGCG3"Me), ‘Yabukita’ green tea beverage (0 mg/day of EGCG3"Me), and a beverage made from parched barley. Ingestion of ‘Benifuuki’ resulted in statistically significant improvements in both nasal symptom score and symptom-medication score. The decreases in these scores began immediately after the start of intake of ‘Benifuuki’ and lasted until intake ceased. In contrast, no significant changes in the nasal scores were observed with either ‘Benifuuki 1/2’ or ‘Yabukita’ or the parched barley beverage. No adverse physiological, hematological, or biochemical parameters effects were observed; the immune responses of peripheral blood leukocytes were normal, as were the patients' subjective symptoms, throughout the experiment. * Yasue M et al. 2005. J Jpn Soc Clin Nutr 27:33-51. A double-blind clinical study of 30 subjects with Japanese cedar pollinosis was carried out. 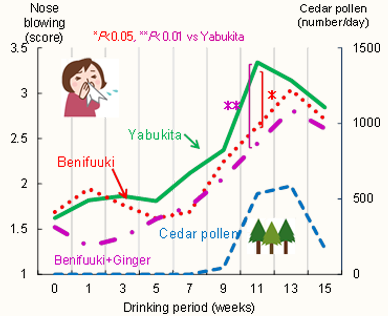 At week 11 after the start of the study--in the most severe cedar-pollen-scattering period--symptoms (nose-blowing and itchy eyes) were significantly relieved in the ‘Benifuuki’ intake group compared with the placebo group. Nose-blowing and throat pain were also significantly relieved in a group that took ‘Benifuuki’ containing ginger extract compared with the placebo group. *Maeda-Yamamoto, M et al. 2007. 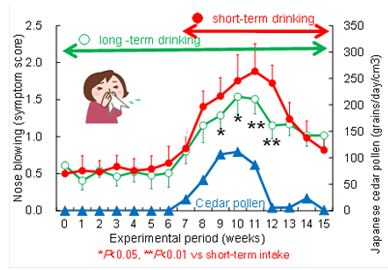 Drinking ‘Benifuuki’ green tea containing 34 mg of EGCG3”Me/day for 1.5 months before the cedar pollen season (long-term intake) significantly reduced symptom scores in Japanese cedar pollinosis compared with short-term intake started after the beginning of the pollen season. *Maeda-Yamamoto, M. et al. 2009.